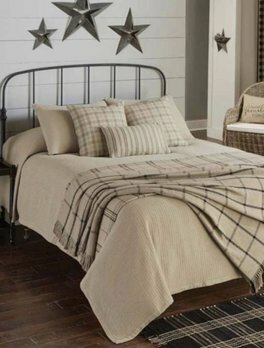 The Farmhouse Star Bedding Collection features a stunning design set in black, browns, cream and ivory with applique stars. The 5 point design has a full selection of coordinating pieces in our online store. You'll love the color and texture of the Oatmeal Farmington Queen Bedspread. Because of it's earth tone this bedspspreod is very versatile. Designed by Park Designs it measures 94" x 108". This will fit wit the he country, farmhouse, or lodge look.